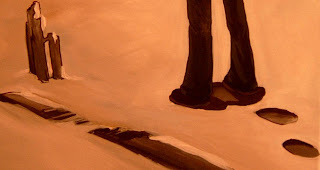 A new painting...in progress..literally right now. Taking a slight break for Chamomile tea and conversation with Christian. First image with a flash for color, the rest without for detail. 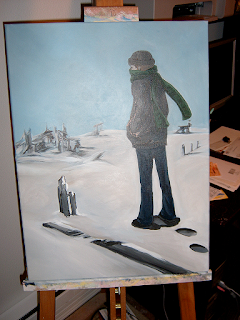 Right now I'm correcting the perspective by pushing the snow up and out. Visually its the equivelent of raising it to about eye level with the man.